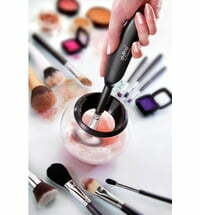 Clean your make-up brushes in style using the world's first brush cleaner! Not only does this nifty device clean brushes, but it also dries the bristles enabling immediate use thereafter. The innovative centrifugal technology needs only 30 seconds to clean the bristles effectively and carefully.